EDG projects are supported on a reimbursement basis. Claims can be submitted when all project deliverables have been achieved. Claims must reach Enterprise Singapore no later than six months from the end of the project qualifying period*. *Refer to project Letter of Offer for details on project deliverables and project qualifying period. Projects should have been completed within the specified qualifying period, and all project deliverables should have been achieved. For first time applicants, complete the Giro form and mail it to the address indicated on the document. No action required is there is no change to the Giro details. Cost Items Documentation for audit (e.g. Invoices, bank statements, employment contract, etc.). 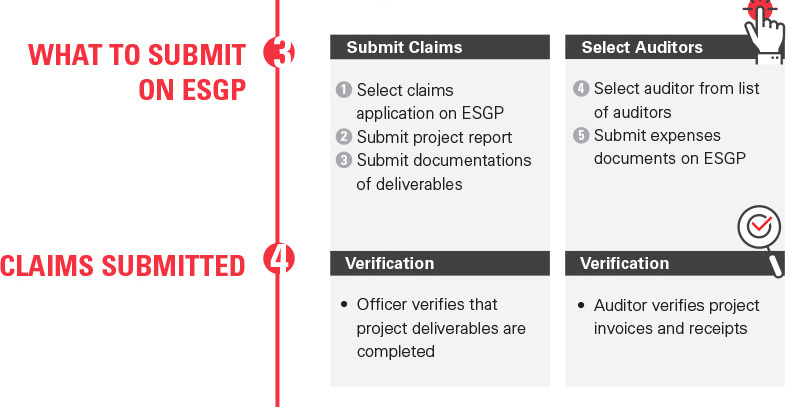 Log on to the Enterprise Singapore Grant Portal (ESGP) and select “claims submission”. Refer to the ESGP Step-by-Step guide and Enterprise Singapore Grant Portal FAQ for more information. Upload the project summary report and the documentation of project deliverables in the ‘Project Information’ tab. In the ESGP Claim application, select an auditor from Enterprise Singapore’s Pre-Qualified Panel to verify your claim submission, unless expressly exempted by Enterprise Singapore. Upload the cost items documentation (e.g. invoices, bank statements) as Claims Submission documents in the ‘Claim Information’ tab. Upon completion of the above steps, submit the claims application. Record the claims application code for future reference. If you require technical support regarding the submission of the claims application, please contact Enterprise Infoline. An Enterprise Singapore officer will verify that the project deliverables have been met, and may contact you for further information if required. A site visit or presentation meeting may be arranged for this purpose. You may be asked to revise your Project Report if the information is incomplete. Concurrently, the auditor that you have appointed will verify your claim documents and issue an Audit Report upon completion of the verification. The auditor may contact you for further information if required. The approved claim amount will be disbursed within six to eight weeks via GIRO to your designed bank account after successful verification of project deliverables AND expenses. First time applicants will need to ensure your GIRO account is set up and furnish the GIRO information to Enterprise Singapore for fund disbursement. You will be informed via email when the grant has been approved and disbursed. An email will also be sent out by DBS to the email address stated in the GIRO form to confirm the transaction. For instructions on CDG claims submission, please follow the EDG claims process. To submit a CDG claim, please click here. For instructions on GCP claims submission, please click here. To submit a GCP claim, please click here.